Raw honey is one of nature's great treasures. 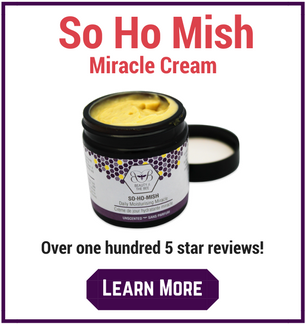 Containing small amounts of natural bee pollen, royal jelly, propolis and beeswax, the benefits are plentiful. Growing up on a honey farm and now as a nutritionist, I have learned these benefits first hand and use this powerful food in my home, with our customers in our honey store and online when doing nutritional consulting. So what exactly is the difference between raw honey and the perfectly golden, liquid honey that you see often bottled in a squeezable hive at your local grocery store? First of all, a raw product has not been heated excessively through pasteurization. The only way to get that perfectly clear look of most commercial honeys is to heat it and then filter it excessively. The problem with heat is that many nutrients are very sensitive to it and die. You may get strange looks when you tell people your raw honey is 'alive', but you're absolutely correct to a certain extent. From recent studies, we know that there are living, healthy bacteria such as acidophilus in quality raw honey products. It is these probiotic bacteria and natural enzymes found in raw honey that make it so digestible to humans. Raw honey is filtered, but very minimally and in a manner not to destroy the health promoting enzymes and other nutrients. The reason it is filtered is to remove any hive debris from the honey. Otherwise, you could be eating bee parts and anything else that has made its way into the hive. Raw honey is liquid when bottled. Within weeks, it will become solid at room temperature and it often looks mirky or milky. It is not a golden and perfectly clear liquid once it has solidified, like the majority of honey products you'll see on the grocery store shelf. Not all honey products are created equal. Often times less desirable, less nutritious, pasteurized honey is marketed in such a way to lead us to believe all honey is the same. When selecting a raw honey for you and your family, make sure the words “raw" and "unpasteurized" are on the label. It is also important to look for the country of origin. Make sure you are comfortable with the country it is produced in. If you are using raw honey for your allergies, you'll want a locally sourced product. Also, it is best to have honey from only one country of origin. A lot of mass honey producers will blend honeys together from a variety of countries. As long as the majority of the honey is from one country, they are allowed to say it is from that particular country on their label depending on labeling laws. 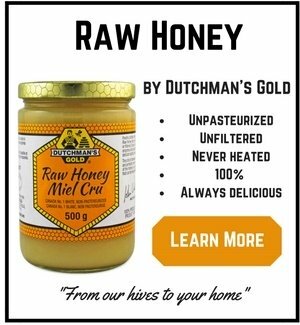 For example, our Dutchman’s Gold honey is from Canada only. It is 100% pure and true to the label. 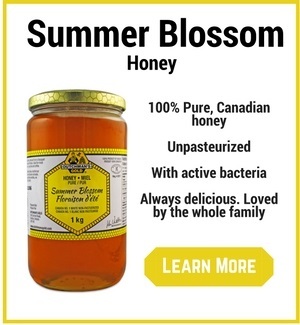 John Van Alten, my father and Master Beekeeper of over 35 years, knows of honey packers who purchase their honey from off shore sources and blend it all together claiming it is Canadian when in fact it is not. Honey packers do this because off-shore honey is usually cheaper than the honey they produce or that they can buy from local producers. So a honey producer is able to claim that the honey is of certain quality and charge the market price for honey of that grade yet he's spent less on it than his competitors. At the end of the day, he's made more profit. Raw honey has many, many health benefits with dozens of scientific studies to back them up. There are now studies indicating that raw honey may be beneficial for dozens of health challenges including diabetes, blood pressure, cholesterol, allergies and even for cough and colds. I recommend that you read the comprehensive list I have compiled of the many benefits here. How Much Raw Honey Should I Consume? We must remember that despite its many health benefits, raw honey is still sugar, albeit a natural, unprocessed sugar and much healthier than table sugar or the many artificial sweeteners on the market. 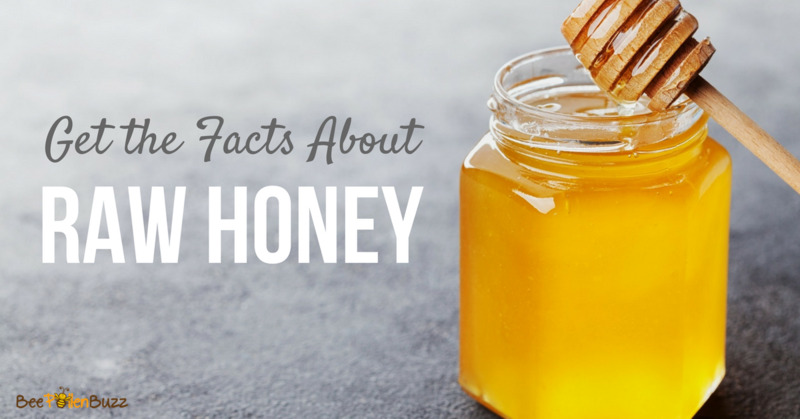 Honey is comprised of glucose, fructose, maltose and sucrose along with some water. It is important to limit the consumption of sugars so I do not recommend more than one tablespoon of raw honey per day for adults and no more than one teaspoon per day for children. There are a number of reasons why honey is healthier than sugar. First of all, it contains fructose and glucose which are easily assimilated by the body. Glucose and fructose are monosaccharides. These monosaccharides (simple sugars) do not have to be processed by the body – they enter the bloodstream easily and together do not produce as much of a blood sugar rush. Fructose specifically is much more slowly absorbed than glucose. As a result, raw honey has a much lower glycemic response than sugar. It enters the blood stream much slower and actually provides stable, longer lasting energy. On the other hand, white table sugar is “foreign” to the human body, called a disaccharide. A disaccharide (sucrose) has to be broken into glucose down by the small intestines before entering the bloodstream. So this is more work on the body and more work by the pancreas and causes more of an insulin “rush” or crash after consumption. For the same sweetness, 1 TBSP Honey = 1 ½ to 2 TBSP Sugar. As you can see, using raw honey provides fewer calories but the same sweetness. This is because of the monosaccharide content. Raw honey can be found for sale in a growing number of places as it increases in popularity. Your local farmers market is almost sure to have a beekeeper or two selling their products. There is a good chance they'll have a raw honey for sale. Your local grocery store might also stock it as more and more people demand this healthy food. This is hit and miss. If you have a quality health food store locally, raw honey is usually found on the shelves. If none of these options work for you, visit my online store﻿ and have it shipped to your door.